Forty years ago, George Rossiter started out building sleek, streamlined wooden row boats by hand and sold them one at a time. In 2007, Scott and Cindy Hanson bought Rossiter Boats assuring George that his legacy was in capable hands. Under Scott’s direction, Rossiter quickly outgrew the original shop and the business moved to a modern, state-of-the-art plant in Markdale, Ontario where the tradition of craftsmanship continues – still one boat at a time. George designed his first power boat over ten years ago – the Rossiter 14, and in 2013 introduced its most sophisticated power boat yet, the Rossiter 23 Classic Day Boat, subject of this review. 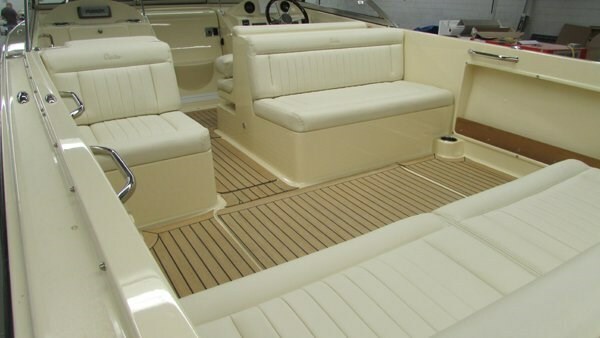 The R23 is one of four outboard powered models from a 14-foot side console open boat, two seventeen footers – a center console and a closed deck classic runabout, to this 23-foot cuddy cabin. Rossiter also builds over seven different models of rowing boats which include yacht tenders, skiffs, recreational sport shells and its most popular model, the 17′ Loudon double-ender. As with all Rossiter boats, the R23 is constructed to be “unsinkable” and contains no structural wood components with 100% composite construction and a self-bailing fiberglass inner liner cockpit. Even the eight stainless steel cupholders are self-draining. All Rossiter power boats are a variable deadrise true deep-vee design up to the maximum practical vee of 24-degrees. The deadrise on the R23 is truly deep at 22-degrees at the transom offering smooth wave-cutting capability. 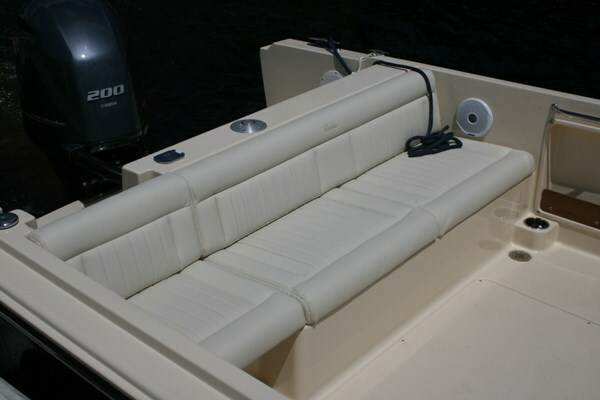 Beneath the seat cushions of this stern bench seat are two similar sized, drained molded-in compartments; one reserved for storage and an insulated one intended as a fish box or cooler. The swim platform is unique in that its underside is part of the hull and its aft section is actually the boat’s transom. 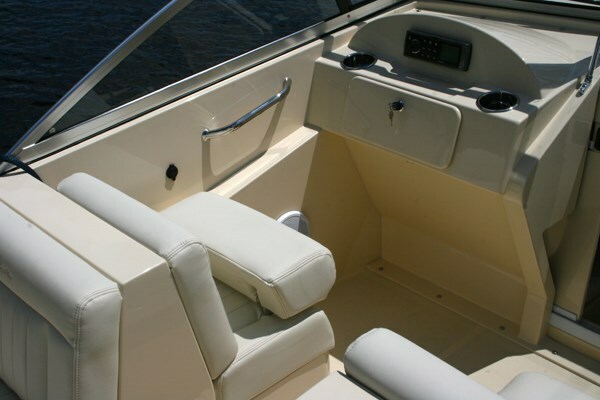 The benefit is a full-width platform with lots of space between the motor cowling and the stern bench seat to allow easy side-to-side access. A four-step stainless steel telescoping boarding ladder is affixed to the starboard topside of this platform. 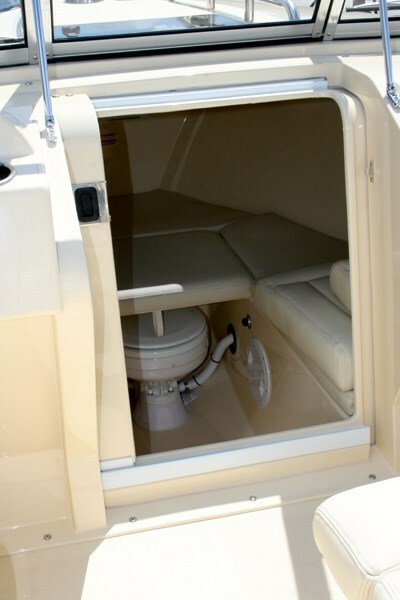 Access to the cuddy cabin is via a sliding, lockable, white acrylic door with a molded-in step to assist in access to the foredeck when in the closed position. Once inside the cabin, the unique positioning of the foredeck opening hatch immediately forward of the windshield base, permits even easier access to the foredeck. This positioning also provides “cleaner” deck lines. 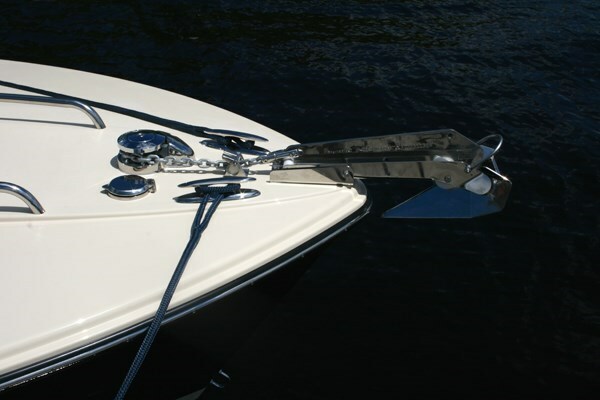 Extra long sturdy stainless steel grab rails on each side of this hatch extend forward toward the bow. 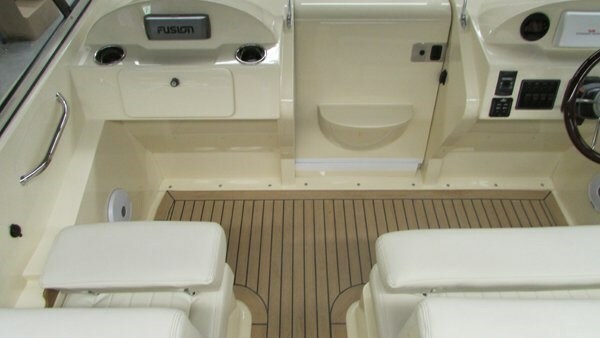 The cuddy cabin features port and starboard side full-length cushions meeting together at the bow with a centre aisle plus a forward centre aisle section removable cushion. A standard marine head with holding tank is located beneath this cushion. The cuddy cabin itself is multi-purpose as a huge lockable storage compartment, a private change room, or for snoozing. The very practically laid out molded fiberglass helm sports a six-spoke, padded steering wheel plus instrumentation of your optional choice depending on your choice of motor brand. The molded passenger helm features a lockable glove box. The high, protective, five-piece windshield features open-able vents in the side wings to assist in ventilation and windshield de-fogging, especially during those very special Canadian early spring and late fall morning and evening cruise times. The Rossiter R23 is rated for a maximum 250 horsepower of the outboard brand of your choosing but Rossiter recommends 200 horsepower as optimal. With this, Rossiter indicates a time to plane of 15 seconds and a top speed of 43 mph. 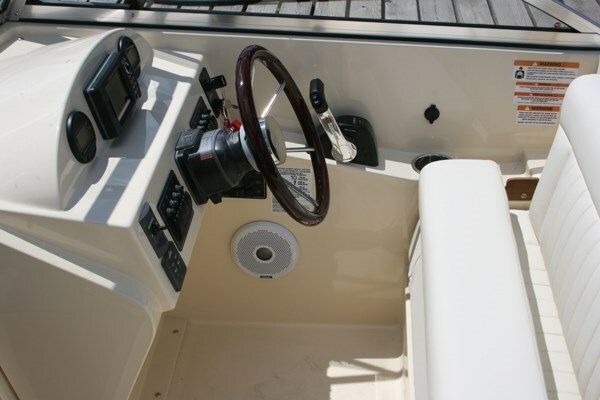 Other notable standard equipment includes freshwater wash-down, multiple 12-volt receptacles, LED courtesy lighting, dual batteries with switch, plus trim tabs. 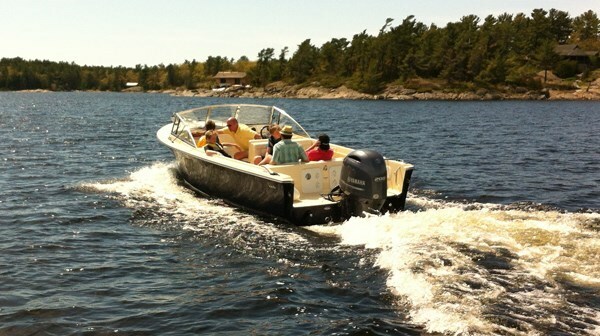 Notable optional equipment includes a choice of convertible top or bimini top with or without enclosure curtains, port and starboard windshield wipers, anchor windlass, stereo with MP3 connectivity, flush mount GPS, underwater lighting, docking lights, cockpit table, pop-up ski tow bar, portable 50-quart cooler for the swim platform, and a choice of removable cockpit carpet or Faux-Teak flooring.